GALLERY 38 is pleased to present a group exhibition highlighting nine emerging artists. 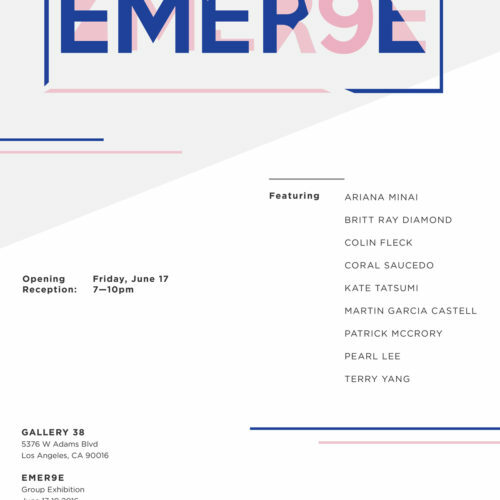 The show, “EMER9E,” will show recent works by the artists: Ariana Minai, Britt Ray Diamond, Colin Fleck, Coral Saucedo, Kate Tatsumi, Martin Garcia Castell, Patrick McCrory, Pearl Lee, and Terry Yang. The group is made up of either soon to be, or recent graduates of Art Center College of Design, located in Pasadena, California. While the members of this show all come from diverse and separate backgrounds, there are similar threads that tie their work together. The group’s work centers on interpretations of culture, society, identity, and the complex connections that hold all of these constructs together. The work manifests itself in facets of paint, sculpture and interactive installations, all designed to use space, color and texture to invite meaningful conversations relating to contemporary issues.